This Cowboy Caviar recipe has a really strange name for a appetizer. It’s also eaten as dip with tortilla chips, but is an absolutely must try recipe. It originated in Texas, created by the food director for Nieman Marcus. According to Wikipedia, it was given its name, “Texas Caviar,” as a humorous comparison to true caviar. It has no fish or real caviar in it. It’s really just another version of a bean salad, perfect for barbecues. Which perfectly complements our Australian lifestyle. What Beans Go In Cowboy Caviar? Black eyed peas are very popular in the American south. If you eat them on New Years Day, it’s considered to bring you prosperity. Black eyed peas aren’t eaten very often here in Australia, and are called Black eyed beans here, in the canned bean aisle. They are incredibly good for you. A one cup serving contains calcium, folate, protein, fiber and vitamin A, among other nutrients. All for less than 200 Calories, plus it’s very filling too. Black Beans are also a part of this Cowboy Caviar recipe. I think I prefer to eat this as an alternative to bean salad, as I make a tasty 7 Bean Salad, but this is so much more colourful. I guess it’s true, we do eat with out eyes. The tortilla chips are optional and they do make a great dip when you scoop up the Cowboy Caviar. You can control the amount of Tex-Mex spiciness you prefer. Some people like to add even more sugar, but I think this recipe is perfect. How Long Will Cowboy Caviar Last? 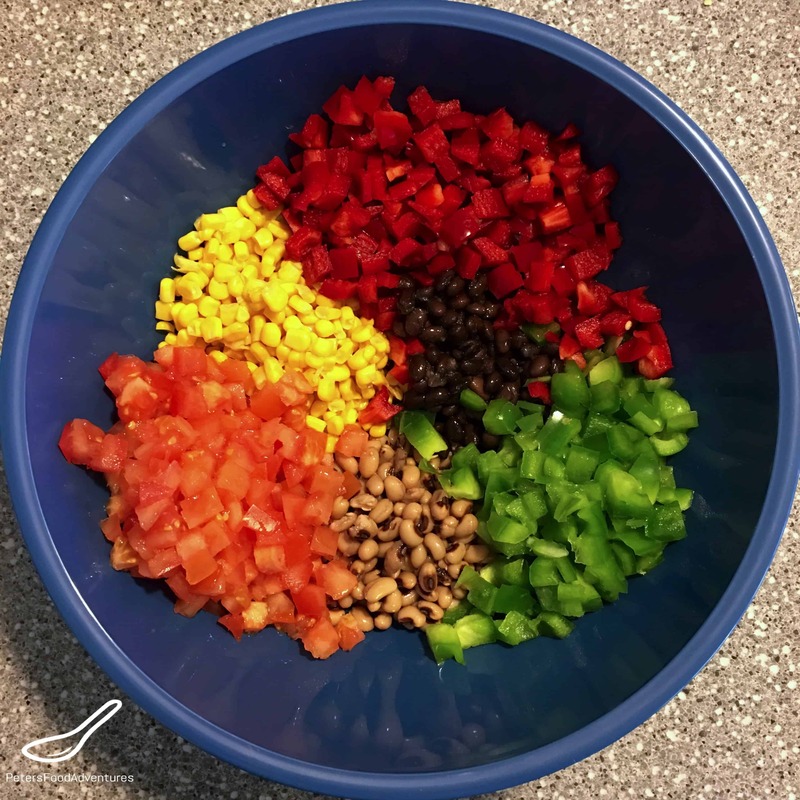 Cowboy Caviar can be prepared in advance by a day or two, if you don’t add in the dressing or avocado. When making this Cowboy Caviar recipe, I don’t always add the avocado. I find that it can go mushy when you mix it in, and I only add it at the very end when I’m ready to serve. It will last in the fridge for a few days after being made, but I find it gets mushier the longer it sits. The pickled vinegar dressing will keep the avocado from going brown. If you don’t want to make the dressing, you can just use an Italian Dressing, and add some Tabasco for a flavor kick. Just like real caviar is small and uniform in size, I use an onion chopper to cut all the vegetables for Cowboy Caviar small and uniform. You might be great at dicing vegetables the same size, but the chopper is easy to use and a great time saver. 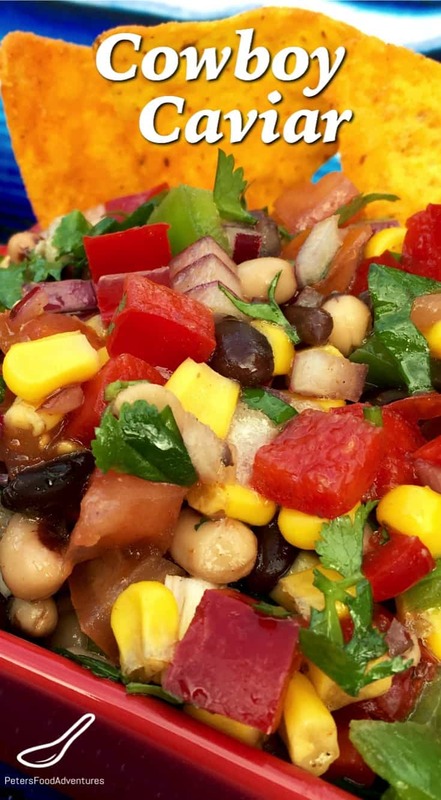 Give this Cowboy Caviar recipe a try, either as a dip or as a salad. Perhaps we could join this Texas tradition, and it can become a new Australian bbq staple. Bon Appetit! Приятного аппетита! Over a colander in the sink, drain the cans of beans and corn and rinse well with water. Put the beans in a large bowl. Add the onions, red pepper, green pepper, tomatoes, avocado and cilantro. In a separate container, mix together the vinegar, sugar, chili powder, tabasco, salt and pepper and stir until the sugar dissolves. Add the oil and mix. Add the dressing to the vegetable mixture and toss gently until well coated. Enjoy with nacho chips or as a salad. Add the avocado just before serving, as it can go mushy when mixing throughout. I really enjoy the idea of the pickled vinegar dressing, It seems super interesting and tasty! I enjoy your blog and the articles you have on pickling and fermenting – I don’t think pickling and fermenting gets enough love! Thanks Billy! I agree and also love pickled and naturally fermented foods! Thanks for checking it out! ??? ?